My beautiful baby…who isn’t really a baby anymore! Wow, I just realized that it’s been a long time since I’ve blogged! Since the end of the school year, I’ve been settling into my new routine as a full time stay at home mom, as well as continuing to plan our wedding (33 days! EEEKKK! ), and keep our house clean and functioning. When I was in school full time, I was only gone and away from Amelia for two days a week, but with school and homework on my mind 24/7 I feel like I wasn’t able to give her all of the attention that she needed. Now, it’s pretty much all about Amelia, all the time. It’s exhausting, but I wouldn’t have it any other way. I knew coming into my summer break, that staying home and taking care of Amelia full time would be challenging and exhausting at times, but we have been having so much fun! Also, if anyone tells you that being a stay at home mom is easy, they either have someone helping them 24/7, or their lying. I’d be inclined to say it’s the latter, because no matter how you look at it, taking care of a toddler, full time by yourself, is a lot of work! Now, I’ve also been working at finding time for myself as well, because I am the kind of person that can’t give to others if I don’t have time to decompress and breathe. Ten hours a day of taking care of a baby/toddler solo can really wear me down, so I try to maximize my time when I can, because alone time is such an important factor in my life. I kind of had that during the two 10 hour days each week that I was at school, but it wasn’t relaxing so I wasn’t feeling the personal fulfillment that I really needed. 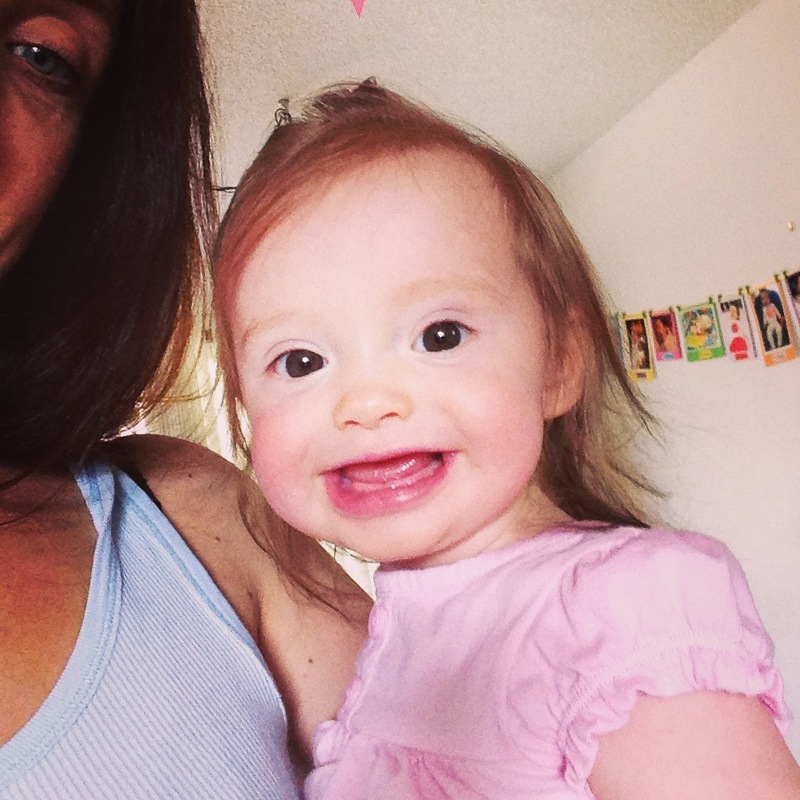 It took me about two weeks to really get into a routine with Amelia. Now that she’s older, we can’t just sit around the house all day like we did last summer when she was a newborn. And thank God for that, that nearly killed me! Those of you who know me, know that I don’t adjust well to sitting around, I never have, and neither does Amelia. So, in my quest to find fun things to fill up our days, here’s a little timeline of what we’ve been doing for the past two weeks! Tuesday and Thursday: In the morning we go to the YMCA and I work out for an hour and a half and put Amelia in the daycare so she can play. I’m really thankful for the daycare at the Y, because this gives me two days during the weekday to not be on baby duty, wedding planning duty, house cleaning duty, bill paying duty….you get where I’m going with this. I get on the treadmill and run hard and zone out for 40 minutes, and then lift heavy things for the rest of my alone time. It pretty much rules…and Amelia being in the daycare guarantees at least a two hour nap, which also rules! Because during her nap I can accomplish other said duties that I can’t do when she’s awake. The afternoons are kind of up in the air, and it really depends on Amelia’s mood, and the weather. Sometimes we go over to our friends house so Amelia can play with her bff Elise (and I can hang out with her mama Rachel), and sometimes they come to our house to play. There’s a park within walking distance of both of our houses so if time permits, we will take the girls to play at the park. The swings are Amelia’s favorite! She also likes pushing her stroller around instead of playing with the toys, which is kind of funny….I just roll with it. Amelia and her BFF Elise at Amelia’s bday party. This picture melts my heart! Monday and Wednesday: This week we started a morning swim class at the Y! Rachel and Elise are in the class too, which makes it so much more fun! Yesterday was our first class, and in true Amelia fashion she had the biggest, derpiest smile on her face the entire time. And she kept trying to swim away from me! She really was out of control! I was surprised considering that it was her first time in a pool. Elise on the other hand, wasn’t so sure, but, I think she had a good time! This is a 4 week class and we get to go every M/W, so it’ll be a good way to fill up our mornings, and wear Amelia out. See where I’m going here with these morning activities? Play Amelia hard in the morning, she’ll come home and take an epic nap, and I get some time to myself to clean, blog, and relax! Yesterday she was so whooped from her first swim class that she slept for 3 hours! In the afternoons, it’s more of the same. We may go play with our friends Rachel and Elise, or we’ll go run errands. Amelia also has another baby friend named Juniper that we like to go play with! 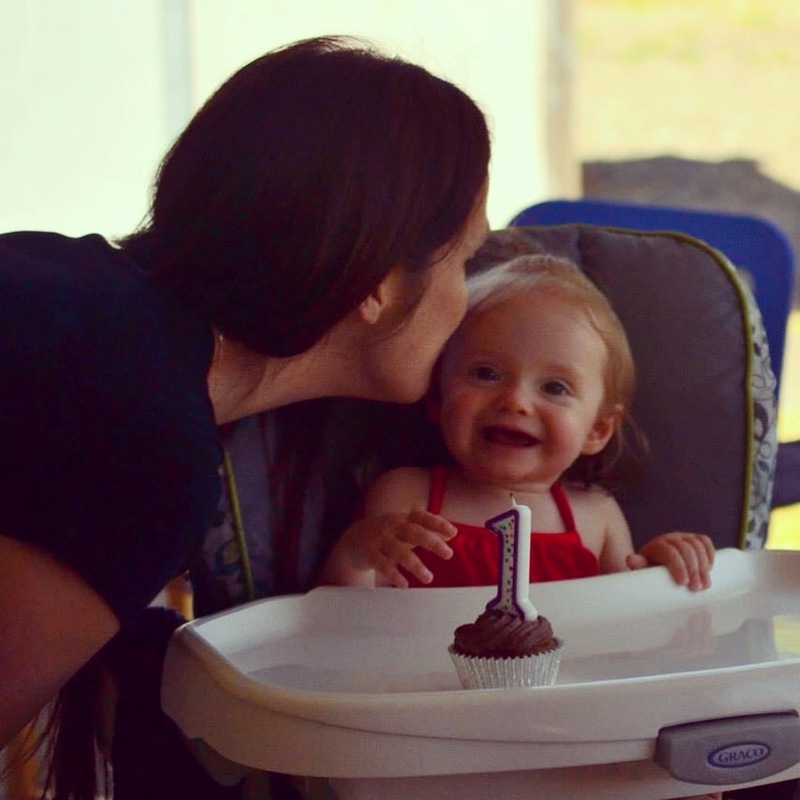 Her mom, has been a friend of mine and Casey’s for a long time, and it’s so great that she has a little one almost the same age as Amelia (her and her partner also have older kids as well, and Amelia really likes them)! They really like each other a lot, so it’s fun to go visit. My friend lives across the street from a big park here in Tacoma, so last week we went over to join her and her family for a picnic! 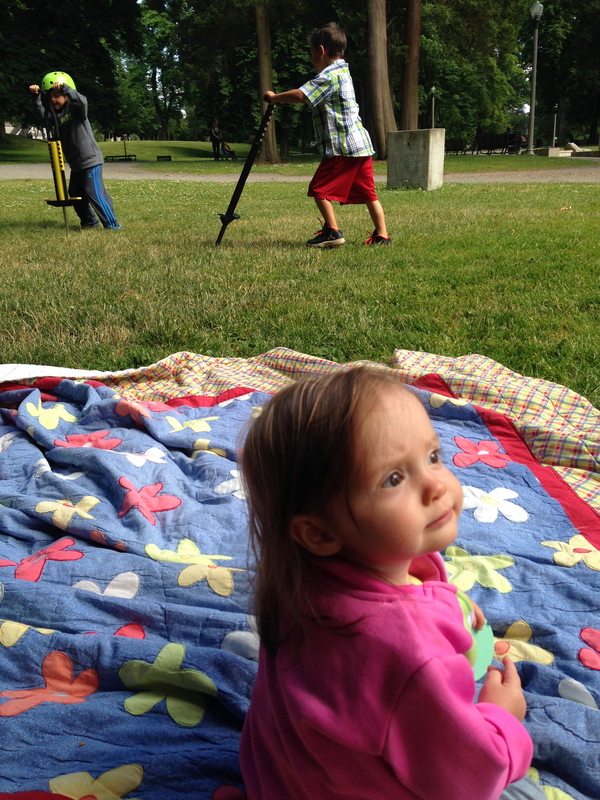 It was wonderful to sit in the grass on blankets, eat snacks, and watch the kids play. Pogo sticks, sunshine, and babies. At the park with our friends last week! When we run errands in the afternoons, it’s most likely that we are going to Target to pick something up, or we will walk to the grocery store to pick something up for dinner. I love that there’s a grocery store across the street, because then I can’t justify driving and that forces us to get out and get a little exercise! Sometimes we make a detour and hit the park on the way home so Amelia can swing, and if I’m in need of an afternoon pick me up we stop at Starbucks for an iced coffee before we hit the park. Yes I’m addicted to coffee, yes I know it’s expensive, and yes I’m okay with it! Sometimes it’s the only thing that I get during the day that’s a treat, so I think it’s justified! Anyways, back to Target……there really is a reason that I’m rambling on about our afternoon errand runs! 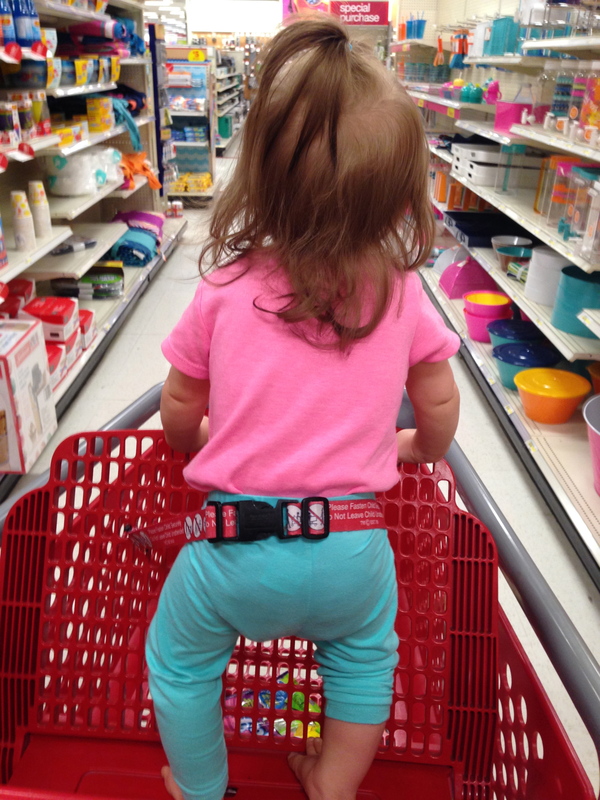 Amelia loves the carts at Target! It’s pretty hilarious, because she refuses to sit in them properly, and will only stand up facing out. Again…..It makes her happy, so I just roll with it. So, I have to strap her in and hold onto the back of her pants while she smiles and points at everyone as we walk by. This kid! She’s so funny! They see me rollin’…..they hatin’…. Friday’s: This is kind of a free day for us. By the end of the week, I’m exhausted so we just kind of play it by ear. Sometimes in the morning we will go to “toddler gym” at the Y with Rachel and Elise….we actually do this throughout the week, but since our mornings are filling up now, it may just be on Fridays. Who knows! The girls love it. It’s basically an open gym area with lots of toys and crazy kids running around. It’s pretty overwhelming and chaotic, but the kids have fun. 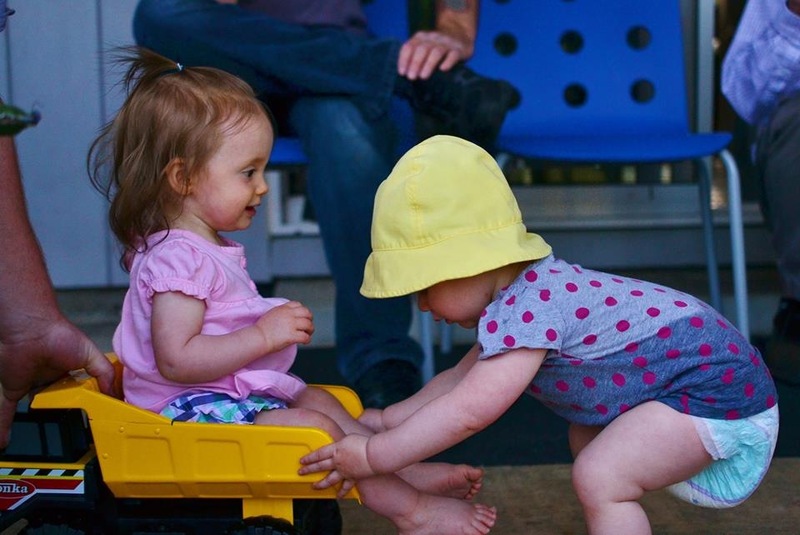 I’ve had my fair share of little bullies at toddler gym this week, and have wanted to ring a few parents necks, but I need to keep my aggression and Mama Bear-ness at bay, so I just take Amelia away from the mean kids and we play on. 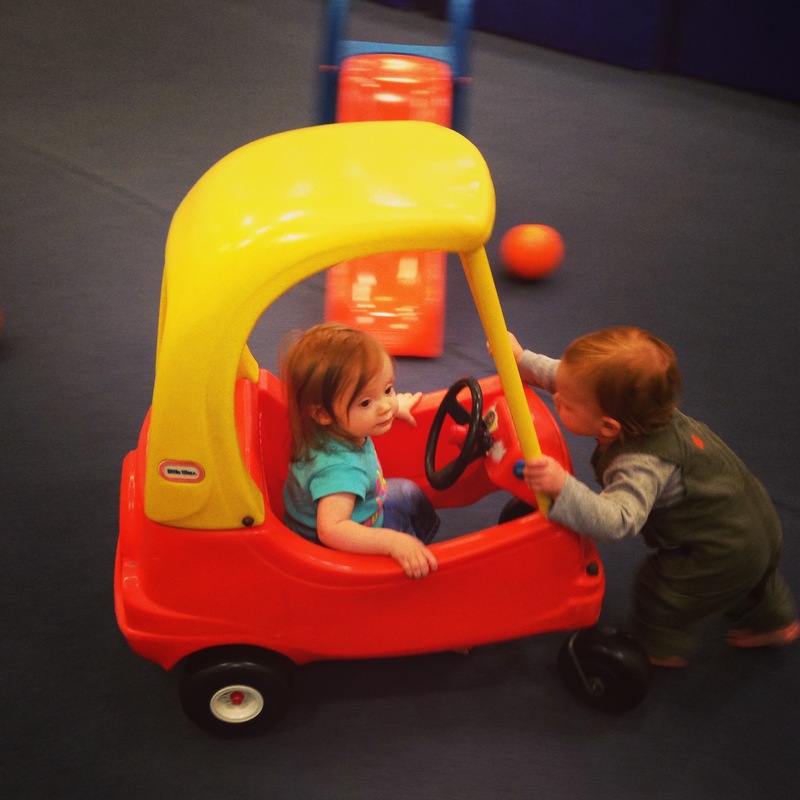 Elise pushing Amelia around at Toddler Gym. See a theme here? I do! Love these kids! Anyways…..so, yeah, that’s a look into my life as stay at home mom and some of the things that I do to keep us busy and entertained. Damn, I’m exhausted! But, it really is a lot of fun! Some days I just want a minute to myself and I get frustrated if I’m really tired, or Amelia has woken up a lot during the night. But, then I sit back and reflect on how full and wonderful our lives are. Not a lot of moms get the opportunity to stay home with their kids like I do. I get to watch my baby grow and learn during some of the most important stages of her life, and I feel so blessed, and so fortunate! Yes it’s hard!!! Yes, I’m tired and need a break sometimes!!! Yes, I could do without Amelia needing to be attached to me 24/7. I could use some space to myself, and time to make a cup of coffee in the morning! But, at the end of the day , it’s worth it. I love my little bug, I love my family (and friends), and I love my life! As I see it, from here on out, it’s only going to get better…..and I can’t wait!